Ralph W. Brown Jr. was born into a Christian home in Tampa FL. He was reared in the loving family of a faithful Baptist Minister, and lived primarily in Florida, and Tennessee. He trusted Jesus Christ as His Lord and Saviour, and was baptized in a Baptist church at the age of eight years old. After graduating high school, he served four years in the United States Marine Corps in a combat unit. It was during his military service in Jacksonville NC that he met Stacy Lea Thomas, as they both served the Lord at Grace Baptist Church in Jacksonville. At the time of his honorable discharge, the Lord lead him to Bible college in Pensacola, and on into the Gospel ministry. Ralph began serving as a youth pastor and music director during his college years in 1988. He and Stacy were married in 1991. After 11 years as an Associate Pastor, Pastor Brown was used of God to start a church in Michigan, and pastored there as Senior Pastor for 5 years. in 2004, he and his family were called here to Milwaukee to serve at East Side Baptist Church. Pastor Brown is the church’s fourth Senior Pastor. East Side Baptist Church was founded in 1964. The church is in a thriving district of Milwaukee, three blocks south of the UWM Campus. 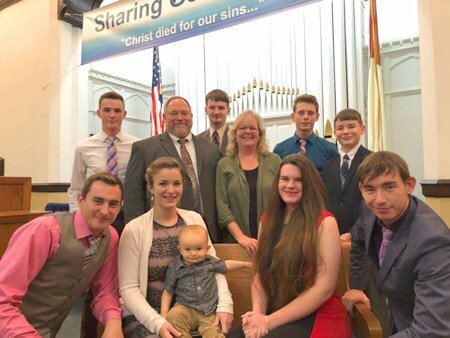 God has blessed the Browns with two “adopted” sons (Doyle & Daniel), one daughter (Christyne), and six sons (Joshua, Timothy, Levi, Daniel, David, & Jonathan). In the recent years, God has increased their family with 3 daughters-in-law (Christeen, Gabby, & Maria), and six grandchildren! Their family that lives here in Milwaukee (pictured to the right) serves here at East Side Baptist Church. “Big Dan” and his family serve the Lord in Muskegon MI, at Faith Baptist Church. East Side places an emphasis on Christ Himself, believing that He wants to live HIS Life through every Believer, every day! The Church’s burden is to see folks trust Jesus Christ as their Saviour, and be biblically discipled and equipped to walk with Him faithfully. East Side Baptist believes strongly that every Believer must be grounded deeply in the Word of God, as Christ, the written and Living Word, is our only true foundation. East Side has studied at least 22 books of the Bible together since 2004. East Side is a smaller, very close-knit church family, that ministers Christ to families and individuals in the Milwaukee Area.